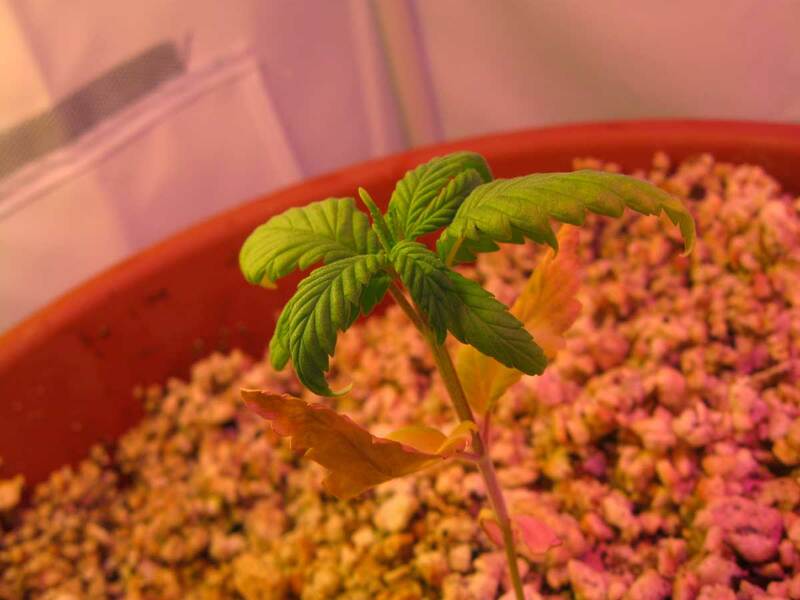 This seedling was being grown in pure perlite, which is not a suitable growing medium for cannabis, and as a result the roots were not getting the proper levels of air and water. 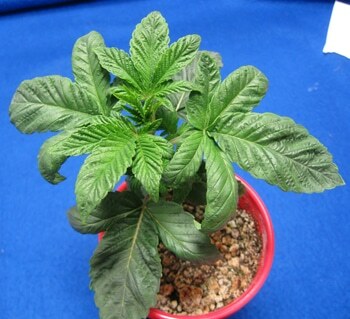 This seedling needs to be transplanted to soil or coco (or even into hydro) in order to get better. 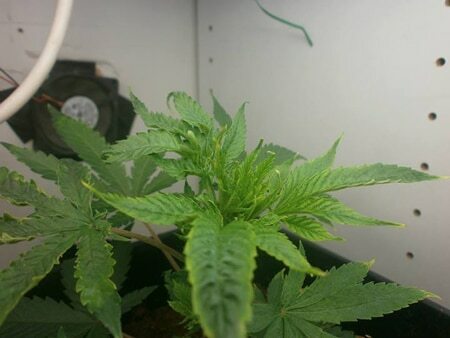 This clone was give the same amount of water from when it first sprouted. As the plant started getting bigger and drinking more, this wasn’t enough and became chronically underwatered (a different type of root problem, with similar symptoms). What this particular plant needed was to be given more water at a time. One warning flag was that the plant was drying out every day (you should only have to water your plant every few days, if it’s drying out in just one it likely needs more water at a time). 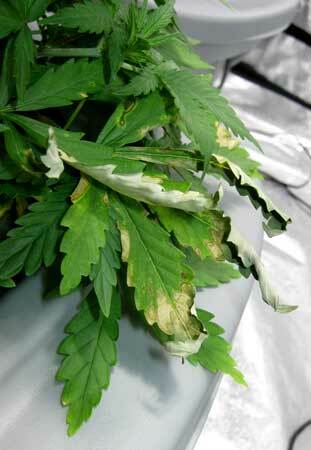 It’s always a good idea to listen to your plants when deciding when to water, as opposed to following a set schedule. Each plant and environment is different, and what works for some plants may not work as well for others! 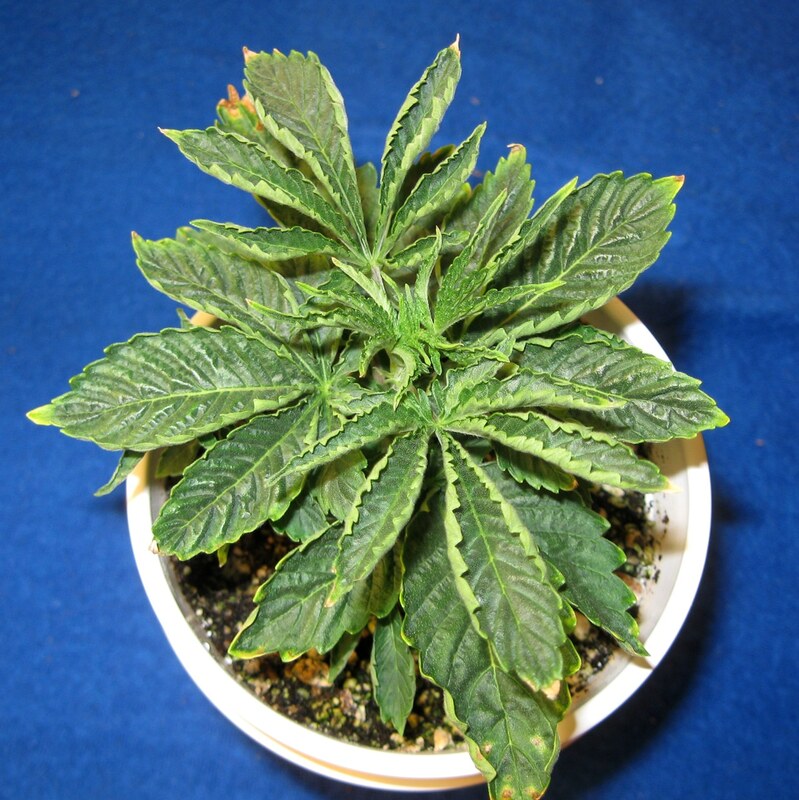 The cannabis plant below did not have any drainage holes (water could not drain out the bottom of the pot). Notice the strange twisting of some of the leaves. When roots are left in stagnant water for too long, they cannt get enough oxygen and tend to develop root problems. 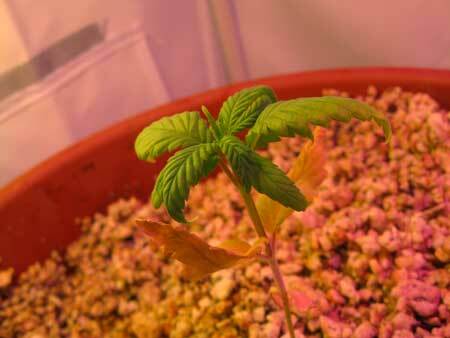 More overwatered marijuana seedlings – these were overwatered since theyf first germinated. 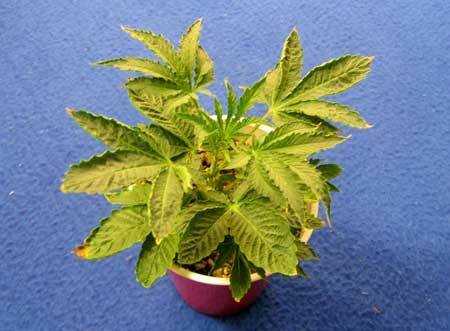 If leaves are drooping down in normal heat, but still seem kind of “fat” it’s often something with watering or roots! This particular type of cupping of the leaves below is common among cannabis plants with root problems. In this case, the plant had no drainage from the bottom of the solo cup, so water was just pooling at the bottom for the roots to sit in. 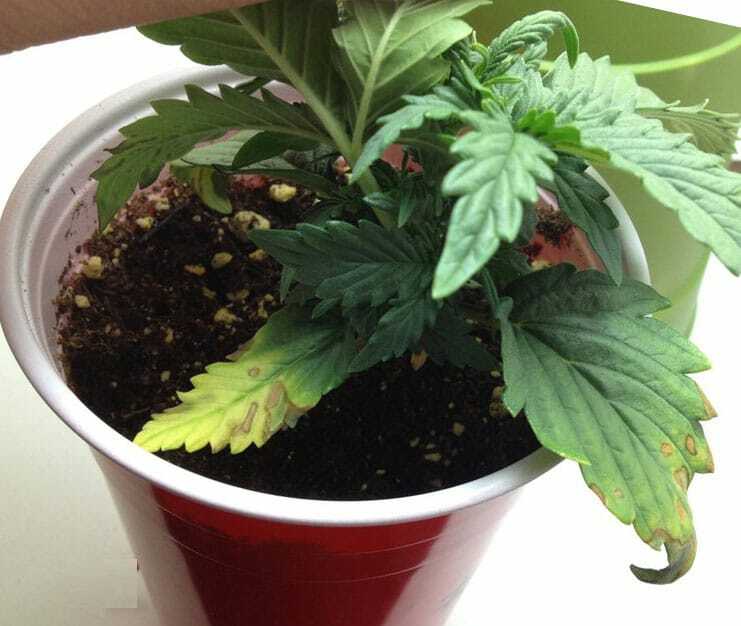 Once the grower poked holes in the bottom of the cup, this problems went away (the cupped leaves didn’t recover, but new leaves started growing in happy and healthy). This next plant was also overwatered and had no drainage. Notice how dark the soil is and the green algae growing all along the top of the soil – these are more signs the plant has been overwatered for quite a while. You should never water your plant when the soil is still wet at the top, and if you notice lots of algae growing on top of your soil, it may be a sign that you’re overwatering on a regular basis. The grower went away for a few days, so they chose to overwater their plant in hopes it would be enough water until they got back. While they were gone, they had a huge heat wave. 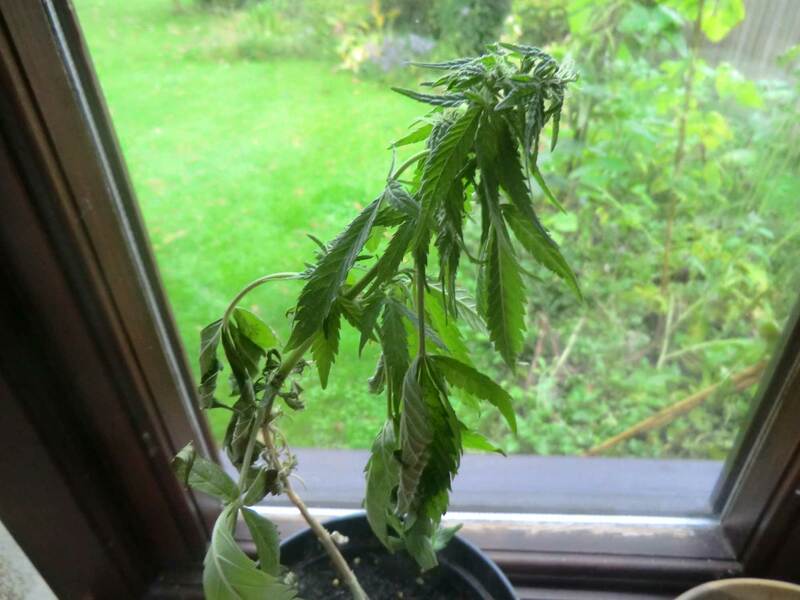 So this plant was subjected to overwatering plus heat. 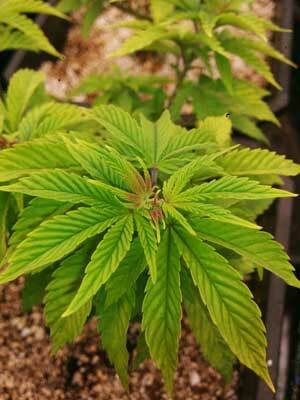 A few days later, when the grower came back, they saw that the leaves were cuppping upwards and had turned lime green. The stems and veins of the leaves were turning red. 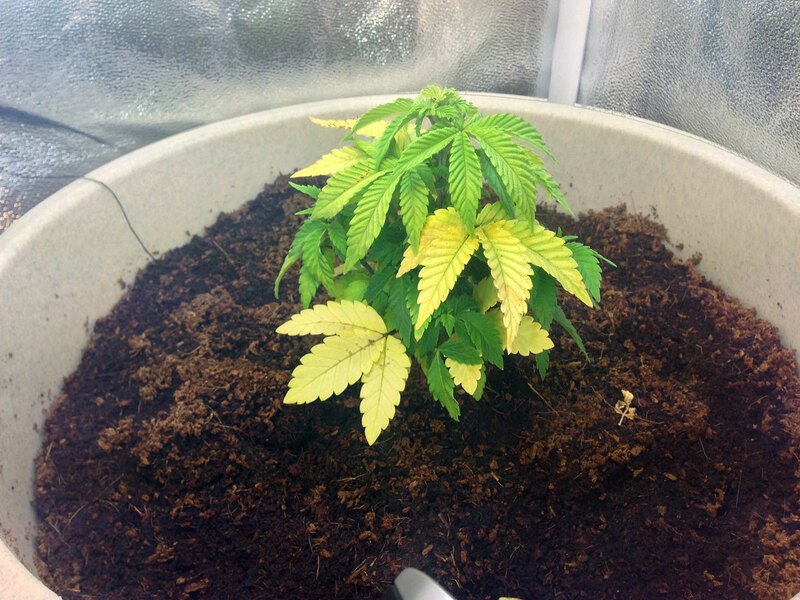 You can see the soil is still dark and wet because the plant stopped drinking after developing root problems. 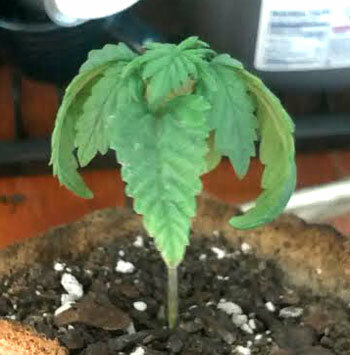 The following seedling is almost a month old, but it’s been overwatered its whole life. As a result, it’s stunted and small. The biggest hint that the roots are at fault is the fat, droopy leaves. The fact that it’s a small plant in a big container also makes it more likely for plants to develop root problems. 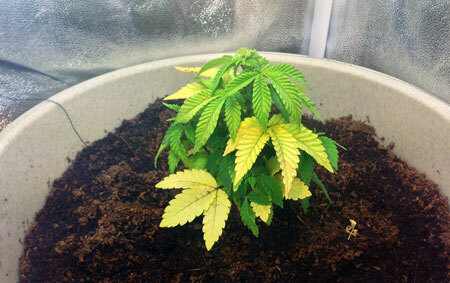 The strange yellow and red growth in this picture has been caused by giving the plant too much water, too often. 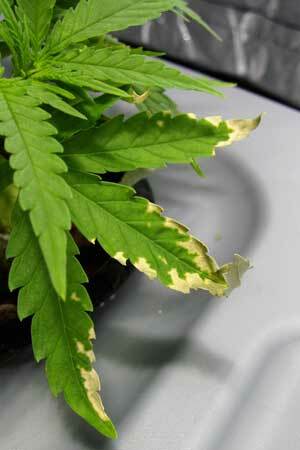 Overwatering can often causes what appears to be nutrient deficencies in young plants! 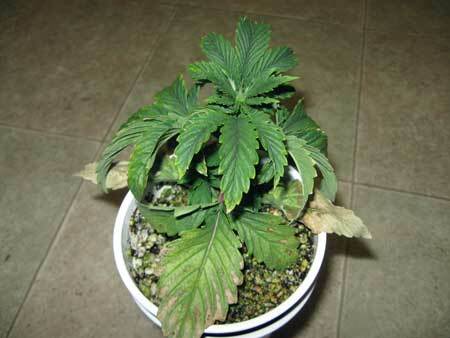 Older plants tend to just droop, but especially seedlings can have really odd reactions to overwatering. 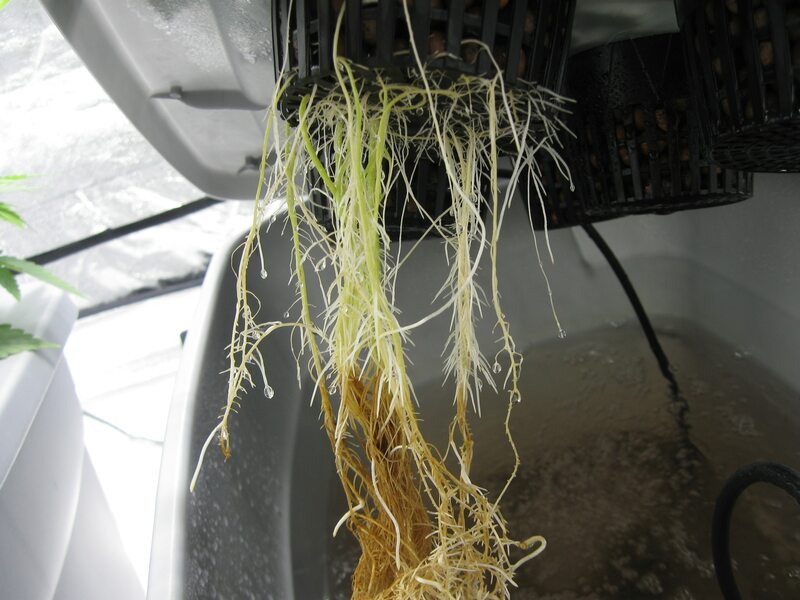 The plants below developed root rot in a hydroponic setup. This is usually triggered when the roots can’t get enough oxygen, usually due to high temps or poor oxidation of the water. Notice the strange burnt appears on some of the bottom leaves. They turned almost white. The whole plant was drooping, especially towards the bottom. The roots turned brown (pictures below). 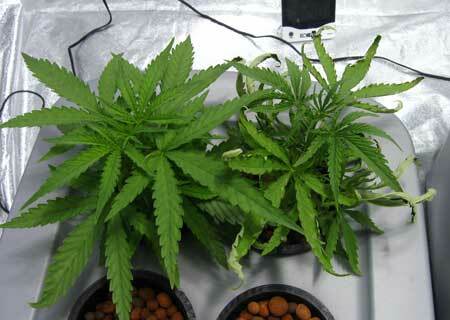 The plant on the right is healthy, and the plant on the left has root rot. It’s interesting how the symptoms from root problems are often similar, whether the problem is in soil or hydro! Root rot! No wonder the leaves were having so much trouble on top. Muddy or thick soil – if your soil is muddy and thick instead of rich and fluffy, it may mean the soil doesn’t hold enough oxygen to support your roots. Small plant in a big container – When a seedling (or small plant) is in a big container, it often has trouble getting enough oxygen at the roots. 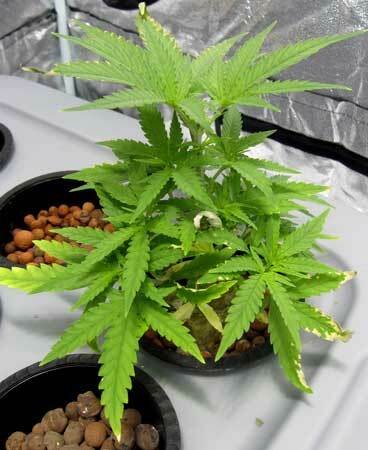 Until the plant has grown bigger and started to fill up the container, it’s important to avoid overwatering. 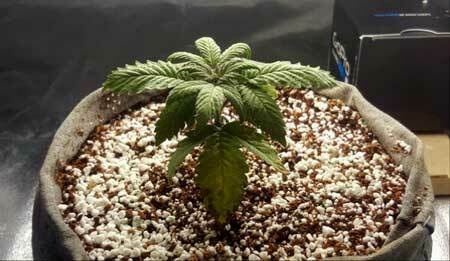 It can help to water just a little bit at a time, in a circle around the seedling, until it starts growing faster. Plant has “overgrown” it’s container (become rootbound) – The roots of a rootbound plant have started circling the outside of the container, causing watering and nutrient problems even if you’re doing everything right. 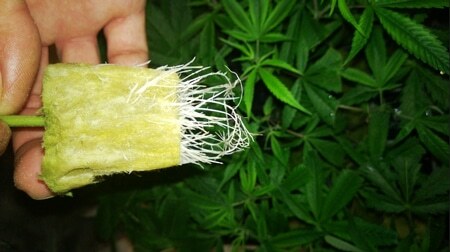 When this happens, you may need to transplant to a bigger container to stop the plant from being “choked” by the roots. 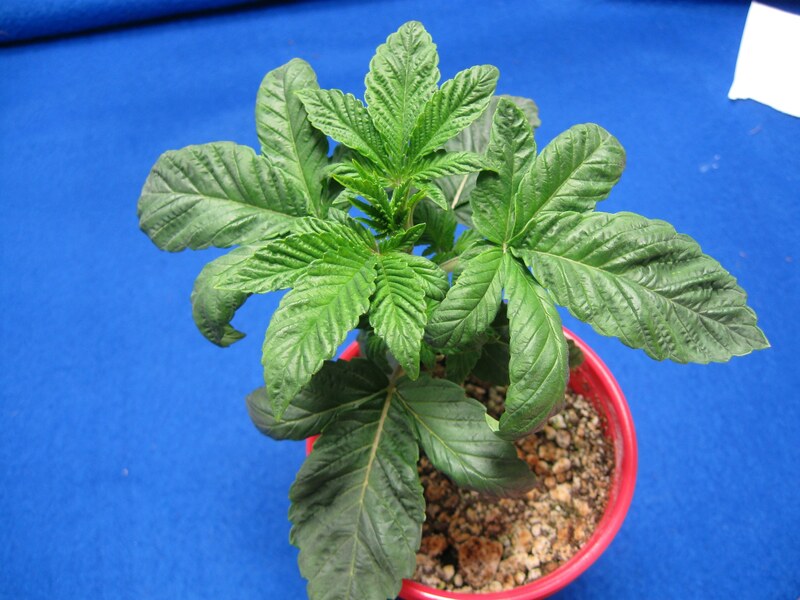 Big plant in a small container – any time you have a big plant in a small container, even if the plant isn’t root bound, you increase the chance of underwatering since the plant quickly drinks up all the water in the soil! 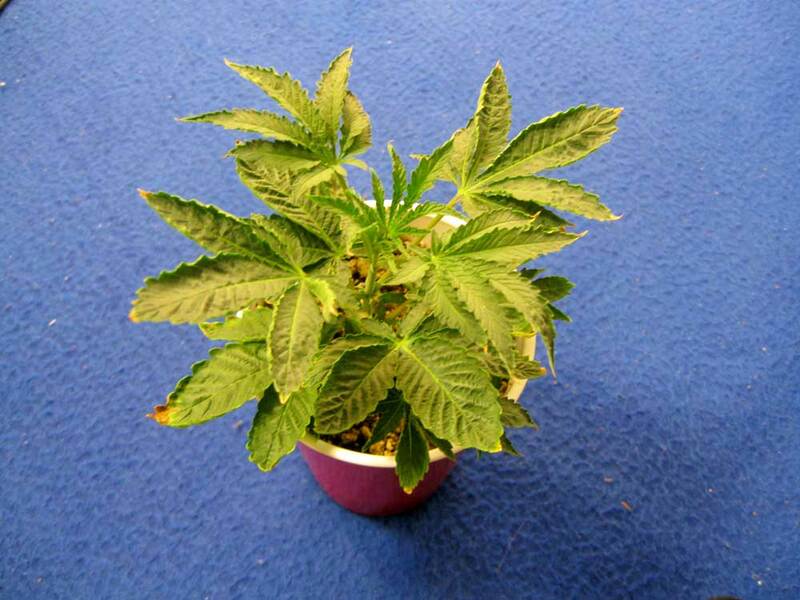 Certain strains are more prone to root problems than others, but good root practices will allow every plant to thrive! 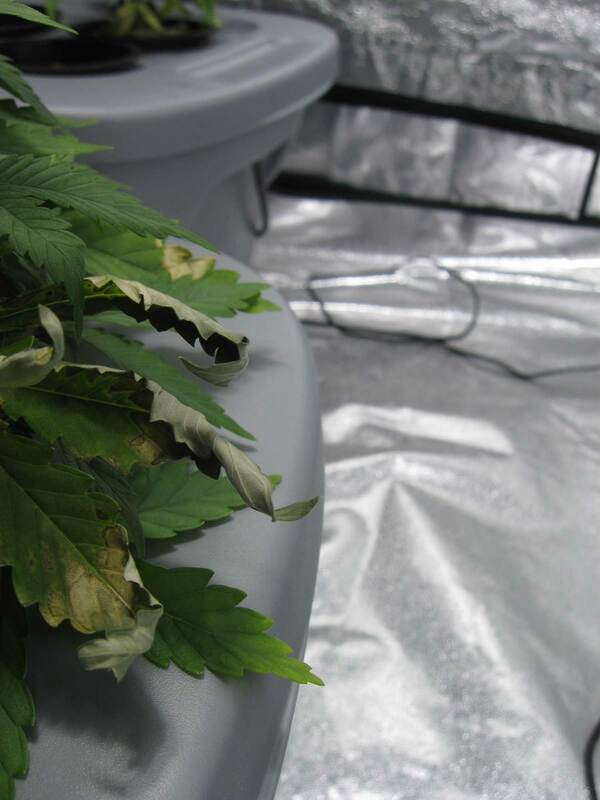 Happy temps – Make sure your grow area maintains a comfortable room temperature during the day, and is a few degrees cooler at night. Learn more about how temperature affects your cannabis plants. Only water your plants when they need it. 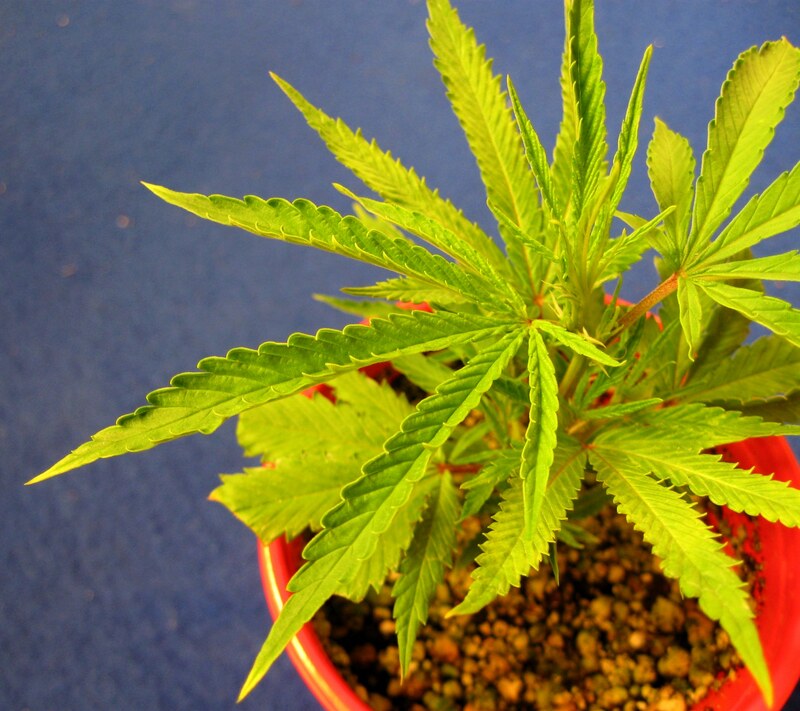 How often should I water my potted cannabis plants? Make sure potted plants have plenty of drainage, and there must be drainage holes at the bottom. If soil or growing medium holds a lot of water, consider mixing in 1/3 to 1/2 extra perlite to “loosen things up” and improve drainage at the roots. Put plants in the right sized container to give the roots the best environment to spread out and grow. 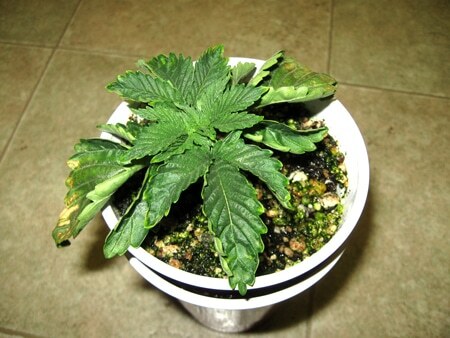 You may need to transplant to a bigger container if your plant has gotten too big or its roots are rootbound. Step 3: (Optional) Provide your plant with a beneficial bacteria like Hydroguard to help roots recover quickly (more info about root supplements below). Hydroguard will help fight root rot by creating a colony of good organisms to outcompete the root rot. 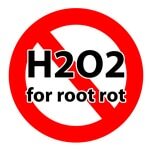 You May Not Want to Use Hydrogen Peroxide (H2O2) for Root Problems! H2O2 is temporarily effective at best when it comes to root problems. By it’s nature, even commercial grade H2O2 will be completely gone from a water reservoir after about 24 hours as it reacts with the water to form oxygen (decomposes) until the H2O2 is completely gone. If H2O2 is added to a water source, it kills most of the bacteria in the water, including any good bacteria, but will not usually be able to kill all bacteria, so some bad bacteria will still be left to repopulate. Because of it’s nature, hydrogen peroxide does absolutely nothing to fix the underlying issue that causes root problems, and it kills any postive bacteria in your soil or water so sometimes it can actually make things worse. I think of H2O2 as a temporary bandaid. Note: Botanicare used to have an awesome root innoculant called Aquashield, but in our tests Hydroguard works even better to create healthier roots and get rid of root rot! Hydroguard is also much cheaper than most other similar root treatments and is proven to work well at supporting root health in cannabis. 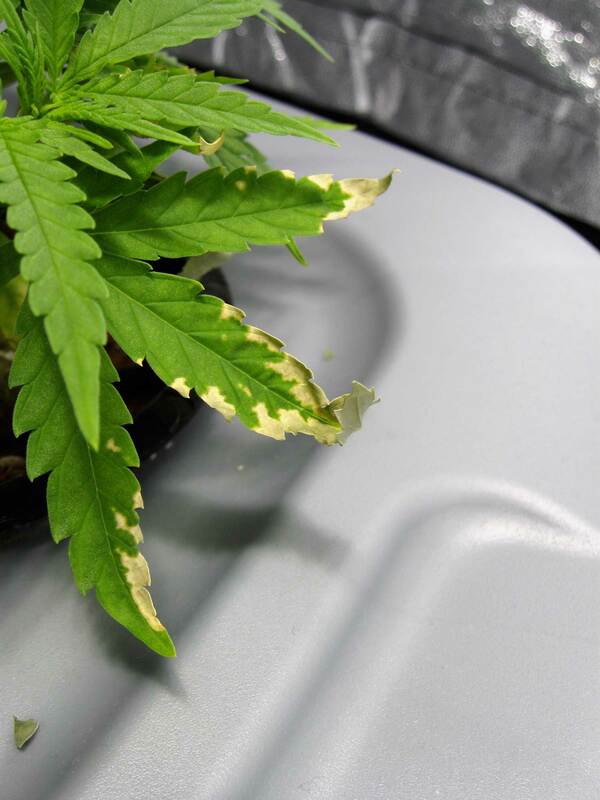 Take a look at our root rot page to see pictures of how Hydroguard was able to completely cure a terrible case of root rot. Other examples of beneficial root supplements include Piranha, VooDoo Juice, Great White (Great White has great reviews, yet is obscenely expensive), Subculture B, Rooters, and Plant Savers. 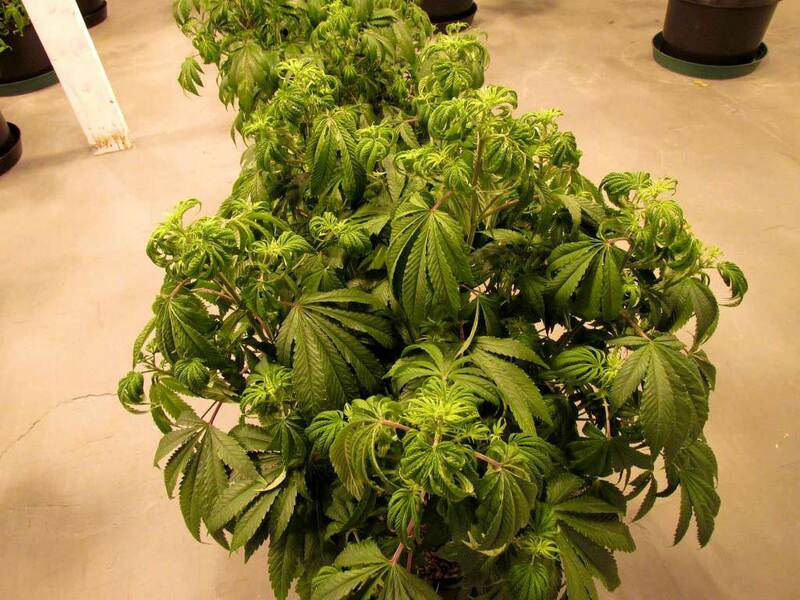 Most of these can be used with both hydro and soil grows. I personally recommend Hydroguard because I’ve used it successfully to treat Root Rot (and it’s also very affordably priced, you can use it throughout your grow without breaking the bank). One important thing to note is that after you treat the cause of root problems, the old damaged leaves may never recover! With recovery, you should be looking for the problem to stop spreading, and for new leaves to be growing in green and healthy. What supplies do I need to start growing indoors (or upgrade)? 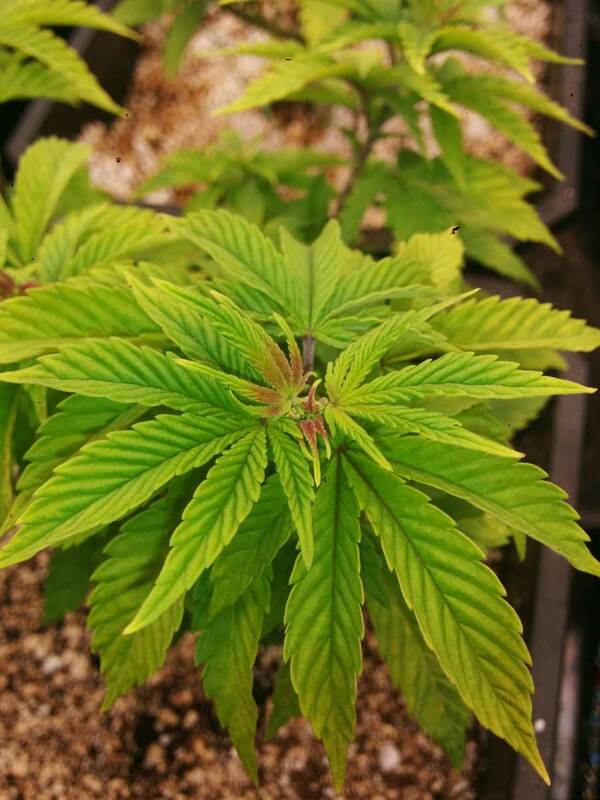 Enough of all the pics with sad or unhappy roots – before you go, here’s a picture of healthy roots growing from a new clone!